Ryan and Scott Fitzsimons' Minecraft avatars, LittleLizard and TinyTurtle (on the left), as they appear in Minecraft. WHEN YOU ASK someone what they do for a living, chances are the answer will be straightforward. They work in an office, they’re in college or maybe they’re self-employed. But what about making your living from gaming, or better yet, playing games and uploading them to YouTube for everyone to watch? The idea of people watching other people play videogames may come across as strange to some, but the space is growing rapidly and from it, numerous YouTube channels and gamers have grown in prominence as this trend continues. One such channel is LittleLizardGaming, which is run by twin brothers Ryan and Scott Fitzimons. Based in Ashbourne, Co. Meath, their channel is dedicated entirely to the sandbox survival game Minecraft – which was recently acquired by Microsoft for €1.9 billion – where the twins record their playthroughs and upload them onto YouTube. The laid-back commentary – almost like your friends are showing you something they discovered – and creative game modes have meant its videos has received more than 173 million views and the channel now has 676,000 subscribers. Combine that with a release schedule of two to three videos almost every day, broken up into episodes and series, and the ability to generate enough ad revenue from YouTube to go full-time and all of a sudden, it becomes quite serious. Not that Ryan or Scott treat it that way. For them, having the opportunity to make a living from something they enjoy is a joy, and discovering new things and showing them to their viewers is part of the appeal. Using Minecraft as the basis, the brothers play modded (modified) versions of the game, which can be based on popular games, TV shows, movies or sometimes original ideas. The latter is a case of having an idea and finding out if there’s a mod that fits the descriptions (Minecraft is open-source meaning anyone can create their own games within it) or failing that, asking a coder to create it for you. What ideas they decide to explore and the games they play depends on what happening in the space itself. 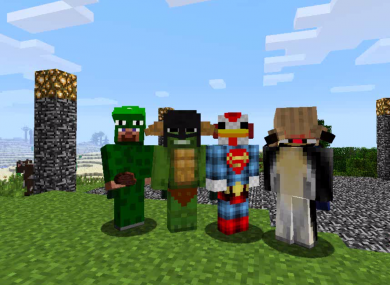 “Sometimes there are big trends throughout Minecraft where one can blow up… and you do it because it’s a lot of fun, but then a lot of the time, we like to sit around, come up with new ideas with things, get in touch with modders, get them to make it and then show it off and people can play it,” explains Scott. The channel is roughly two and a half years old – the first video went up on June 2012 – but it took a while before the channel started gaining traction. The brothers only had the one laptop to use between them when they started off, but figuring out what ideas worked and what didn’t was a case of trial and error. It wasn’t until it Pixelmon (A Minecraft version of Pokémon which they started on Valentine’s Day 2013) that things really took off. Once the channel crossed the 10,000 subscribers mark on March 2013, roughly eight months after it started, its popularity only grew further. While there are a number of factors behind the channel’s success – meeting and collaborating with other YouTubers who play Minecraft to just give one example – an important element was is how they struck a balance between what they enjoyed playing and what people enjoyed watching. Ryan and Scott Fitzsimons in real-life. While Minecraft is their primary focus, the brothers are looking to expand into other areas. At the moment, they are experimenting with playing other games outside of Minecraft, which could potentially lead to a second channel being created, but there’s another area they would like to explore. Before they decided to focus on the channel full-time, the brothers were originally in college studying game development. Now that they have a solid fanbase, they can now explore the possibility of developing their own apps and games and releasing them. Email “These Irish brothers have turned playing Minecraft into a full-time job”. Feedback on “These Irish brothers have turned playing Minecraft into a full-time job”.